The period between Eclipses, as many of you already know, is one of profound change. What can seem chaotic to our human self is nothing but the natural transformation that we, our bodies, and therefore physical life, shall experience, for us to begin a new life. With change comes endings, ones that are the seeds of what will be the foundations of the next phase of our human experience. 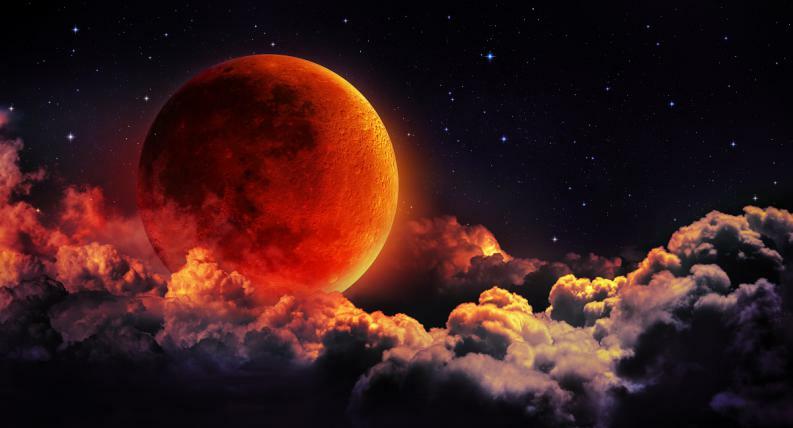 The Full Moon’s Total Eclipse at 4 degrees Aquarius, is the catalyst for the change we all need to transform an old reality and begin to mould a new one. This Eclipse will be a very potent one, especially for its conjunction to retrograde Mars, the Warrior, and its duration, the longest of the century - one hour and twenty-three minutes. As always, it is our choice to use these frequencies some are calling: destructive, challenging, etc. to rebuild and stabilize what is not in alignment with the human experience we desire to live. Energies simply are, it is our human mind that needs to be constantly labelling them according to our human perspective, but the truth is that only our intention, and hence, conscious attention, is what gives them meaning. At the Eclipse time, one taking place in the head of the Capricornus Constellation, we have the Moon in conjunction to Mars, making a square to Uranus, the Planet of Change or Transformation, that many call Rebellion, and semisextile Saturn, which will bring us more soothing energies. All this planetary combination will help us remove the ashes of the old, both internally and externally, giving us the opportunity to release what enslaved us and continue our conscious journey by being free of burdens and limited beliefs. Mars helps us to stay grounded, and even more with Uranus being in Taurus as well, which asks us to create stability, in the physical, in all the changes we make, something vital when we are immersed within a path of self-evolution, for us not to fall into delusional traps and beliefs that only damage our mind and human experience. Some may think/feel being grounded will prevent them from experiencing the delights of the Illuminated Realms. On the contrary, it is precisely by being grounded, and keep a healthy, and open mind, that enables us to descend more Light - Wisdom - and integrate it within our physical bodies, and physical plane, which is why we came here, to descend and experience, our Divine Essence, and gifts, into the tangible. During the Eclipse season, in which we are going to be immersed in different cosmic waves, coming not just from the many planetary events happening within our planetary system, but outside it too, there are many who are going to be experiencing what I call darkness integration. As you know, we live in a dualistic universe, and our main task, as humans, is to integrate both polarities, as equal, for it is only by doing so that we can finally leave behind a limited reality based on the illusion of separation and begin to embrace what unity consciousness truly means. It is at this time that many Starseed Souls, New Earth Seeds and many who are beginning to step into this journey, of selfless assistance, and devotion to All, are feeling the deep impact that change has, for they are being asked to integrate the darkness and for some it is not easy to distinguish all that is occurring. When we are working on the conscious evolution of the Planet, from a place of clarity, instead of mental delusion or illness, which is very common in the spiritual community, and it is fine, for we all need to experience many phases to regain awareness of which path we truly desire to walk, we will be attacked by many forces that are working for the dark polarity. Distinguishing if we are being asked, by our God Self, to integrate darkness, or if instead we are being attacked and/or manipulated by these dark forces is pivotal, for us not to fall in delusional thinking and other dark tactics. When we begin to integrate darkness we may find people, situations and other similar events that ask us to embody this pain, not by feeling attacked or hopeless, but by precisely recognizing this same light under the darkness, realizing that this dark aspect is also willing to come back to the light. We may find all of a sudden people who need our assistance, who are in extreme situations, or other life experiences that we may consider darkness or people we tend to name as being "negative" who need our love. When this occurs, communing with our soul, is what will show us if we are being abused, manipulated or if we are given an opportunity to integrate darkness. When we feel love and compassion and without draining our life force, we truly feel guided to assist others, we are not in the middle of any negative situation, on the contrary, we are acting as the bringers of the light that we are, and assisting those to integrate the darkness, as we do so by not labelling the situation we are experiencing, by not judging their current situation, and by not feeling superiority, on the contrary by seeing an opportunity to be the Lovelight beings that we are, from a space of neutrality and love, assisting until they can see the light by themselves. Therefore, it is so important that we master the ego and begin to operate from a heart space, where the clarity we need resides, and learn to distinguish that not everything is an attack, that at some point, we are going to be invited to stand tall in our power and form this loving and empowered state, assist others. The illusion many in the spiritual community have of being only of the light and dwelling, always, there, is nothing but unconscious egoic beliefs, that are hard to recognize. There are many who are convinced, that if they are touched by "negativity" it is because they are being attacked. Therefore, it is so important to be constantly releasing human beliefs, and even if it is challenging, be open to what our God Self, desires to tell us, for sometimes these negative encounters and/or situations, assist us more than we assist them, to stand firm in our path, and to regain sovereignty, something we could not do if we were just dwelling in the light. Every challenging, negative, uncomfortable, or as you prefer to call it, situation, shows us more about ourselves than about others. It shows us our fears, doubts, egoic feelings, delusional thinking, and above all, if we behave, always, with unconditional love, compassion and humility with ourselves and All, or if we are yet facing feelings of annoyance when we are asked to integrate darkness. In any case, there is always an opportunity for us to grow, and this is what this period of Eclipses brings, the chance for us to embrace a new path, made of all the love and wisdom we have embodied rather than on our egoic desires. The Aquarian Eclipse is a South Node Eclipse, on the contrary of the Cancerian one, which occurs in the North Node. The South Node is all about letting all go and release an old self and life that is not in alignment with who we have become, for when we begin this evolutionary journey, we are constantly releasing old aspects of our lower self, and hence, there is always the need for us to descend and integrate new ones. This is not just happening internally but in the collective as well, for we are beginning to see how the masses are fighting for releasing old laws that enslave them, as well as many others limited structures that they are beginning to realize are only there to disempower them and keep them as mere slaves. The birth of a new era is not something achieved in one day, and even though many claim to be already living in a fifth dimensional reality, it is not yet totally done, and there are many things that we are still here to work with, beginning for ourselves and ending with the society that eons ago was built to keep us enslaved. The period between Eclipses is a blessed one for those who are working on clearing karmic/ancestral patterns for even though you may be already a sovereign being descending from the Illumined Realms, you are incarnated within a human body, which carries your ancestor’s genes and within them many old patterns, behaviours etc. to be cleared, otherwise, the repetition of these patterns will tend to come to the surface, once again. There are many people who once they begin to walk this evolutionary path find out how hard it is for them to release certain customs, habits and/or behaviours that they do not even consider to be part of them or their true soul desires. As I am one who had to deal with a very hard pattern coming from my biological mother, I know how difficult it is when one is literally compelled, against one’s will, to do certain things that do not benefit us, but that for some reason feel as if we shall continue repeating them. Compulsive behaviours are often caused by all the genetic burdens we carry within ourselves and that we have not yet healed. It is pivotal that in the first steps of our ascension path, when these old patterns arise, we take the time to dissolve these ancestral habits and begin to consciously command our genes to release the many behaviours that are not truly ours to experience. These old habits that some may be repeating, without even being aware of it, goes from addictions to substances, attachments to relationships, and many other things we tend to do that are, probably, coming from our family lineage. If you are one who knows your biological family, for in my case it was not like this, then you have a great opportunity to witness yourself and see from who these old patterns are coming and how you are repeating them, for this is the first step towards self-liberation. Releasing an old habit, whether it is a physical or a mental one (for example negative thinking, being a drama feeder etc) is very challenging for your body is accustomed to certain substances and/or thoughts that are part of their energetic food, so to speak, and one must begin to consciously master the self and command our genes to release all that do not belong to what we should experience in this lifetime. This takes time, devotion to the self and constant inner work. The release from ancestral patterns is one of the most liberating experiences one could ever have, for one begins to truly know oneself without other's burdens within. It is then that we start knowing who we truly are, healing our own issues rather than those occurring genetically. After healing ancestral patterns, not just old habits and thoughts disappear but many physical sensations that came with them. It is one of the main things to work with, especially at the time of this Eclipse, when we all have a great opportunity to eclipse what we do not desire or what no longer belongs to us. As Starseed Souls and New Earth Seeds, one aspect of our mission is to help restore the distorted Earth fabrics that were manipulated to encapsulate us within a 3D matrix. As you already know, there are many roles within Creation, and the labels above, are just some names to label the many missions that as ascending souls we are here to fulfil, so this message goes for everyone, who simply has a pure intention to assist planet Earth, independently of the name we prefer to use. With the coming of the Eclipse there are many changes occurring not just within ourselves but in our Planet. The new galactic waves received are creating new avenues for the ones who work with the Earth Grids to restore the long ago manipulated Earth fabrics, helping us to become Earth bridges to connect the restored grids with the New Earth Grid system. At this time, reading, talking and thinking about ascension or how can we assist, will not serve. This is a moment to just be and do what our soul guides us to do, instead of reading or comparing ourselves to others and see what they do to assist, for in the moment we do so, we are losing the unique way we are meant to be of assistance. It is in BEing and not in doing that the majority of the Starseed Souls and New Earth Seeds help in the task of restoring the distorted Earth structures. We all have our own way, the most important thing is to unite as One, and master egoic feelings of superiority, and begin to be of help to our own selves, for most of the time many tend to focus on what they can fix outside instead of beginning from within. It is vital to be totally present, focus on our bodies, while they keep integrating higher levels of consciousness and take care of our bodies, the best we can, for in the moment we allow our lower self to take control and continue feeding it with dense food and many other manipulated non-human food, as I call it, the body is not able to continue its transformation into crystalline matter. For those who feel extreme exhaustion, and above all, you are sure you are perfectly fine, physically and emotionally, and there are no dark attacks, this is where you honor and respect your body, for there are times when you must put yourself before anything else. The fatigue and sleepy periods must be respected for in my personal experience it means my body is releasing so much that if this does not rest, it could not be possible to do so and restore my body to its natural healthy state, again. Everyone is unique, and like I always say, when we are secure there is nothing else disturbing our ascension process, we all must become our own oracles to discern what are real physical pains and what is a natural symptom created by our conscious choice of transforming our bodies to their pure and original state of being. For the stabilizers and everyone whose soul mission involves using crystals, remember that they are our companions and co-create with us to help us anchor, balance and/or any other role they have. Dependency on them can make us lose the real purpose and power from where what we do comes, which is always from within. There are many tools we tend to use that can make us feel as if without them we could not make our task, and there are times when remembering the Divine Consciousness within, is more important than focusing on external tools, which at this time can happen many times. I have received, again, certain regions on Earth where there will be major openings for us to begin restoring the frequency of these places, and grids, for even though our Planet has already bifurcated from old earth, there are still some places highly contaminated and assistance is pivotal for them to regain their lost purity. Karachay Lake, Russia - for the ones whose mission is related to heal Earth Waters etc. there will be an opening we could take advantage of to send healing. The level of contamination is beyond imaginable. There are many Islands where clearing is not possible at the moment, however, there are more new openings, as our Planet continues raising in frequency. Altai, is an independent terrritory of Russia bordering Kazakhstan, Mongolia and China. I have received there is no one able to assist there physically and it is a very restrictive place, apart from the fact that there are certain time/space issues in this land, which makes even more challenging to work there, which is why we could only assist in the astral and by consciously sending healing. As always, take what resonates with your own guidance and feel free to share/add the ones you have received yourself on my facebook page for All to know. Thank you for your conscious assistance and love to all the Earth places that are still in pain due to human damage. For the ones whose mission is different, nonetheless equal, and must work in the 3D world, your task is even harder than the ones that have already taken the decision of creating their own form of living and live only in the places and with the people that are in perfect resonance with who we are. For those who are in this situation, as I know there are many, for there are a lot of people writing to me about this, sharing their situation, you have my most sincere respect and love. Having been there myself before, it is extremely hard to be able to restore the body, at the end of the day, and try to keep it balanced when we are surrounded by people and situations that are simply not aligned with our frequency. This does not mean you are in the wrong place, doing the wrong thing, there is not such a thing as being in the wrong place, for all serves our path. There are many brave and strong souls whose mission is to work in that level, which is even more challenging, and even though there are many who may think these souls cannot be ascending as the ones who are more isolated from these 3D distractions, this is, again, separation, egoic feelings of superiority, between many other judgements. There are no special souls placed in wondrous places, from where they can serve untouched, even though it can seem to be like this. There are many important special souls placed in the places their unique and precious frequency can heal. When one is ready and if the God Self decides so, then if the work is done these souls can pass to a more peaceful human existence, but the important thing is not where we work or the label of what we do, but the intention with which we do it that matters. It is the essence, the love, the compassion we put into what we do, that serves. There are souls doing more challenging work in the 3D world than others who live isolated. I have no judgements, even though by reading this it can seem so. I respect All. However, every time I read or hear someone feeling superior about living in certain conditions others do not, I have no other way than sharing about the importance of mastering the ego as well as to see the same light in other's jobs. I say this even if I am one living in what I consider a perfect reality for me, which cost me years, but the importance of appreciating what others do is pivotal. There are many in the spiritual community, whose smiles, love and light messages, are precious, however, energy speaks for themselves, and there is no one who can disguise what one is. And there is nothing wrong with this, for we all have our time to begin knowing ourselves, witnessing what disempowers us and beginning the endless path of self-evolution. As we continue to navigate through the Eclipses, and until the Lion’s Gate on August 8, the energies will continue increasing. This is a very important passage for the Earth Transmuters - group of souls whose mission is centered on the transmutation of lower energies - filtering and purifying them so they regain their natural light state, again. At the moment, we are undergoing many changes, however, for these changes to occur first a transformation must take place, one that begins energetically until it reaches the physical. These souls who are in charge of transmuting these energies will feel exhausted and if they do it unconsciously, for the majority of the time, it is by our essence that we do our soul mission, will experience depressive periods, if they do not take good care of themselves, for they may not distinguish from where these lower energies or feelings come, and instead of acting as mere filters, could fall into the illusion this pain or lower state of being, belongs to them, when they are just here to transmute and let it all go. Only by knowing oneself and by constant self-observation can one know whose role is the one they brought, for some people can confirm it to you, but no one else will know better than yourself. There are many souls working in public places such as hospitals, and mainly where it involves working with a lot of people or people who are experiencing illness, whose part of their mission is to precisely transform not what these people experience individually, but the collective frequency. Therefore, it is so important that they are conscious of how to use a proper protective layer between other boundaries to be able to fulfil their mission without being directly or intimately affected. During the Eclipses there are many souls working on the dissolution of lower frequencies and there are many whose soul role will even involve travelling to do the work of dark transmutation. It depends on the essence of their mission, for sometimes it is more centered on transmuting the dark energy of Earth and others shall do so collectively, more focused on the dark energy that people, in general, generate. Therefore, being aware of what exactly is your mission is very important for when there are things that may seem similar, they are not, and most who are not yet holding clarity, will tend to resonate with more than one mission, at a time. This disappears with inner work and when the lower self is ready. The important is not exactly what our mission is called or what we do, but how we do it. As I always say, it is all about the intention more than the label in itself. Comparison, as I always say, is another important thing to work with if we are willing to truly disengage ourselves of self-imposed expectation and of fixed ways of doing things. We all are unique and even though certain souls can carry the same mission, not even two can make it the same way. Comparing yourself to others or wanting to do what others do, is a complete waste of the precious, and gifted, soul that you are, therefore know, respect and honor thyself. There are many who are ready, as I received, to descend, and hence, embody in their physical beings, new aspects of their mission, leaving behind their challenging roles as Earth transmuters, although a part of them will continue this work, and being now able to move on from years of feeling tired, sick, depressed etc. in which their bodies have suffered a great deal to be able to filter all these lower frequencies. During the Eclipse, if you are one of those souls, you have the opportunity to release a part of your mission which is already fulfilled and embody new aspects, as many of us are doing. You may not know all the details, this is a path of trust in the Divine, and the only thing we can do until a higher clarity comes, is to flow and continue doing what we feel is our current mission. All comes to us when we are ready. In that moment of illumination, one realizes that one wasted time constantly asking, suffering, and searching outside, in the wrong places and people, what was only within. It is then that one realizes and it serves for the next time, that one simply must wait for when the physical self is ready to receive and that one can only do so, not by searching healing or other things outside but to consciously work on the self, patiently waiting for the right moment in which we finally are ready to descend more wisdom. This is a very potent Eclipse, and galactic passage, in which while we are fully immersed in these healing waves, we could align with them to go deeper within our being and liberate ourselves of the unhealed issues and self-imposed chains that our egoic self is constantly creating. The return of Light Consciousness is a fact, for our Planet is not just beginning to dwell within a higher dimensional space, but also the ones who have consciously chosen to experience this transition. Now, it is pivotal that we do not fall into the egoic trap of thinking we have done it all, for we came here to master the self as well as to assist the Planet until its full transition, which is not done yet. And it is our main mission to act as New Earth Bridges, even in the most challenges times, to make this shift possible. During the Full Moon we have two loving and powerful events - a trine between Jupiter and Neptune, which is still in our Heavens and Venus in Virgo opposing Neptune in Pisces. This is where the ones who have already worked for so long with healing our human ancestral patterns and many other lower layers of the self, are ready to only work on bringing back the lost connection to Source, the feeling of oneness we once forgot and the remembrance of finding love in everything within Creation, not just in the things we consider miraculous, which is everything that surrounds us, but in every creature, being and thing, for this is where Divine remembrance truly begins. Ascension is nothing but the descension of our Divinity into a human self and plane, one we created precisely for this purpose, between many other ones. It is not about running, and wanting to force our progress, for there is no destination, other than assisting while we are in a human body and enjoying the delights of this plane. It is not about constantly seeking and asking, but about BEing in the now, being who we are and doing all we truly desire, from our soul, that truly counts. It is all about being present more than wanting to do and accept where we are, for here, in this moment is where you are being of assistance, is where peace resides. Here is where you exist, and it is only in this moment that you are free and able to create the next one as you wish. When we embrace the moment, we no longer have the need to maintain old frequencies, situations and experiences activated, as we understand that they are just past choices happening at another timeline, it is then that we allow healing to occur, remembering that when we heal ourselves, the invisible threads that connect us with All within Creation make healing possible for All as well. Infinite love, joy, and bright blessings for a wonderful Eclipse, and for a magical everything, always, Beloved Companions. Remember to stay, always, in the Illumined Essence of your God Self, which knows only Love, Truth and Compassion.